Vintage From Paul is delighted to offer these classic Wood & Sons Enoch Blue Colonial Rose Salad Plates. The Wood & Sons Enoch Blue Colonial Rose Salad Plates measure a generous 7-7/8 inches in diameter. 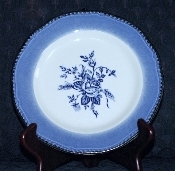 Each of the available Wood & Sons Enoch Blue Colonial Rose Salad Plates is in mint condition. There are no defects or flaws noted. The colors are vibrant, the graphics crisp. The Wood & Sons Enoch Blue Colonial Rose Salad Plates are hallmarked in black with; "Wood & Sons, Made In England,Fine Tableware, Dishwasher Proof, Microwave Safe".